Arsenal boss Arsene Wenger was "frustrated" at Arsenal's failure to secure top spot in their Champions League group and said he is now hoping for a "lucky" last-16 draw. The Gunners will face a seeded team after losing 2-0 to Napoli, with Borussia Dortmund finishing top. "To finish second makes the potential draw more difficult," said Wenger. "In the last four or five years we had a difficult draw. Maybe this time we will be a bit luckier." Had the Gunners drawn in Naples, they would have finished first and avoided being paired with seeds such as Bayern Munich, Barcelona, Real Madrid, Paris St-Germain or Atletico Madrid in Monday's draw. Asked if he regretted not taking a point in the Stadio San Paolo, Wenger replied: "That's the frustration because you feel it was on to do better, but it could have been worse as well." Wenger's side, who played the final 14 minutes with 10 men after Mikel Arteta was sent off for a second bookable offence, finished on the same points as Dortmund and Napoli, who were knocked out because of Dortmund's 2-1 victory over Marseille. Last season's runners-up Dortmund topped the group because of a better head-to-head record against Arsenal. If the Premier League leaders had conceded a third goal, they would have been eliminated, but Napoli's second, from Jose Collejon, left time only for the restart to be taken. Wenger added: "You look at the teams that are potentially there - at least we will know we have a difficult draw. "On the other hand we have qualified for the last 16 for the 14th consecutive year and maybe the number 14 will bring us a bit of luck." Last season Arsenal were drawn against eventual winners Bayern Munich in the last 16, losing 3-1 at Emirates Stadium, before beating the German side 2-0 at the Allianz Arena to go out on away goals. But Wenger said he was not too concerned by who his side face, preferring to concentrate on Saturday's home game against Manchester City. "For us, it gives us a little breather to focus on the championship. We have a difficult game on Saturday and we will see what comes out with the draw," the French boss said. 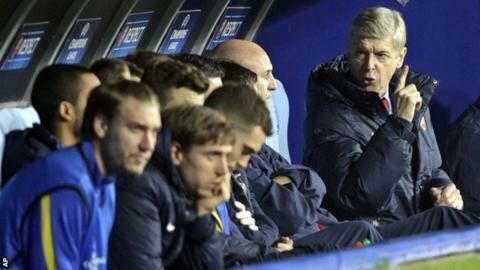 Wenger said Napoli "deserved" the victory and felt that Arteta's red card was "harsh".